This scene from April 9, 1961 is next to Morgan Yard in Long Beach after the special train from Los Angeles had arrived. This was not only the last passenger train to Long Beach, but the last passenger run on what was once the vast Pacific Electric system. 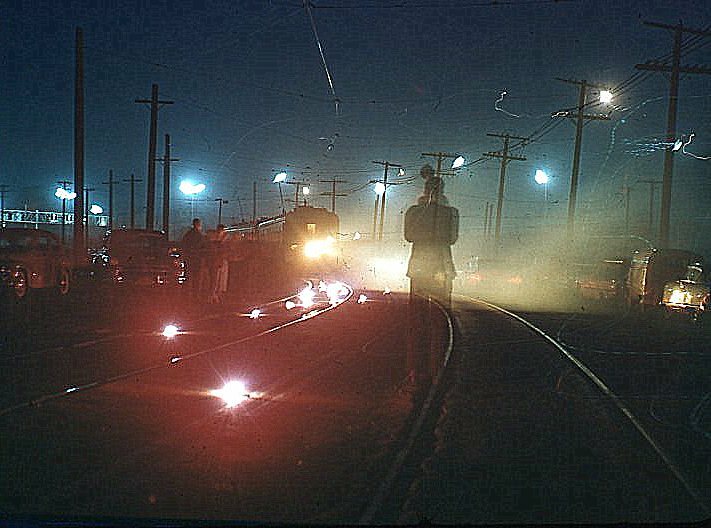 In a prior post on this PERYHS site, Ralph Cantos noted that he, too, was “on the very last run [and] as we pulled into Long Beach at dawn, the track was lined with red flares in the dawn mist.” This view shows the scene he was describing. Another photographer was taking the same picture and can be seen ahead of the camera. After the special passed the Watts car house, the remaining tower car pulled onto the line and closely followed it to Long Beach. 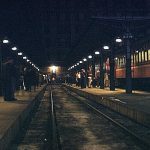 Its work had come to a close, too, and after its arrival a significant amount of railroad equipment suddenly became obsolete. After almost 59 years of operation, it is perhaps fitting that Henry Huntington’s first high speed interurban line was also the last to survive.